A loft conversion is one of the easiest ways to add both space and value to your home. Though you’ll still need to satisfy building regulations, most loft conversion projects don’t require any planning permission. There’s a short list of conditions your conversion will have to meet before you go ahead, so it’s worth discussing your plans with a builder before you start to make absolutely sure. But once you get the green light, there’s really no end to what you can do with your loft conversion. Whatever you choose to do with your new space – whether it’s a music room, a multi-gym, or simply a guestroom – any space can be made to feel more premium, welcoming and useful with the addition of a bathroom. So how easy is it to install a bathroom in a loft conversion? Surely it’s a logistical nightmare to sort out the plumbing in a previously unused space? Not at all. All you need is the right equipment. First things first, you’ll need a means of connecting your extra facilities, which means you’ll need to consider pumps and macerators. You’ll find a handy guide to choosing exactly the products you’ll need for your loft conversion project on our sister site, Saniflo. If you need any more assistance in choosing your pumps and macerators, you can contact a professional Saniflo engineer here. Once you’ve got your essentials sorted, it’s time for the fun part – choosing your fixtures. And at this point, it’s a very good idea to go for a shower cubicle instead of a shower enclosure. When you’re creating a new bathroom in a new space, it pays to keep things simple. A shower cubicle can be installed and operational in less than a day. All you have to do is connect the hot and cold water feeds and the waste pipe, and that’s it – you’re done. You don’t even need to worry about tiling. In the long run, that means less mould, which means that your brand new loft conversion will feel fresh and new for longer. It’s likely that your loft conversion will be built with a timber frame. And while there are many benefits to timber frame builds, wood does have an unfortunate tendency to warp over time. If you choose a traditional shower enclosure for your loft conversion, this warping could result in cracked tiled and grouting. This will increase the chances of mould taking hold, and if left untreated, your shower could even start to leak. Needless to say, the last thing you want in your attic is a leaking shower. But all of these issues can be avoided if you choose a shower cubicle instead of a shower enclosure. This is because shower enclosures are self-contained, and they can be installed without any tiles, silicone, or grouting, making them the obvious choice for a loft conversion. If you’re installing a bathroom in your loft conversion, you’ll most probably have limited space to play with. This means you’ll have to get creative, playing with clean lines, clean colours, and clever storage ideas to make your small space look and feel bigger. But your choice of fixtures is a lot more important than your design choices. Wall-hung sinks will streamline your space, back-to-wall toilets can be used to cleverly hide the cistern, and compact shower cubicles allow you to really make the most of your available room without compromising on style or luxury. 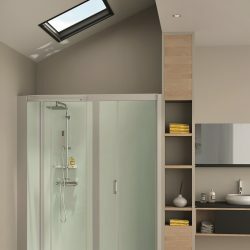 If you need a shower cubicle to make installing a bathroom in your loft conversion a breeze, get in touch for a free quote.